of my options and a little more about the inner workings like LMI. We will be using the topology below. section or the config section. We start by configuring the frame-relay switch. The config is pretty self explanatory but here is how it works. Then we repeat the config for the other interfaces. physical interface and R2 will use a point-to-point subinterface. output from the LMI conversation between R1 and the frame switch. First the debug is turned on. Put the right encapsulation in and unshut the interface. Now lets look at LMI. confirm with show frame pvc. We will now enable frame-relay on R2 and debug LMI there. Look at the LMI output below. we want to use it on the point-to-point interface. The frame-relay interface-dlci tells the interface which DLCI it should use. inverse ARP requests. Look at the output below. R2 responded to R1s ARP request. We can now communicate between R1 and R2. Now we configure R3 and R4 as multipoint interfaces. that maps to the local DLCI. Look at output from R1. R1 responds to the ARP requests and we now have full communication. disable inverse ARP we use the command no frame-relay inverse-arp. When disabling inverse ARP we are disabling requests but not replies. installed in the routing table. Look at the output below. This should have rung an alarm bell right here. Default gateway is not set. We have plenty of successors, so there are potential routes in EIGRP. Remember that a successor in EIGRP is the best path to a prefix. finally realized that I had forgot to turn on ip routing. The routes are now getting installed. installed if we don’t have ip routing configured. except the first one in a session. This isn’t really stateful filtering. We will use a very simple topology with three routers, diagram is below. and traceroute and to establish routing peerings with R2. and final configs from here. reachability and that nothing is being filtered. from R1 to R3 will be inbound. remember to use the reflect keyword. Now we create the inbound ACL. to allow routing because the traffic is terminated on the router. Apply ACL to R2 Fa0/0. Still working. We can also see matches in the ACL. Now lets try from R1 to R3. That was denied. Are we still able to ping R1 from R3? There is also matches in the ACL. Can R1 form an EIRGP peering? be allowed back in it’s a good bet to use reflexive access-lists. If you download the .net file remember to set the IOS image dir and your working dir. This is some notes for the post that I did on conditional BGP advertisement. available by looking at the neighbor status, look at the following output. The prefix is currently being advertised. Then we bring up the interface. 60 seconds by default so it may take some time before we see results. 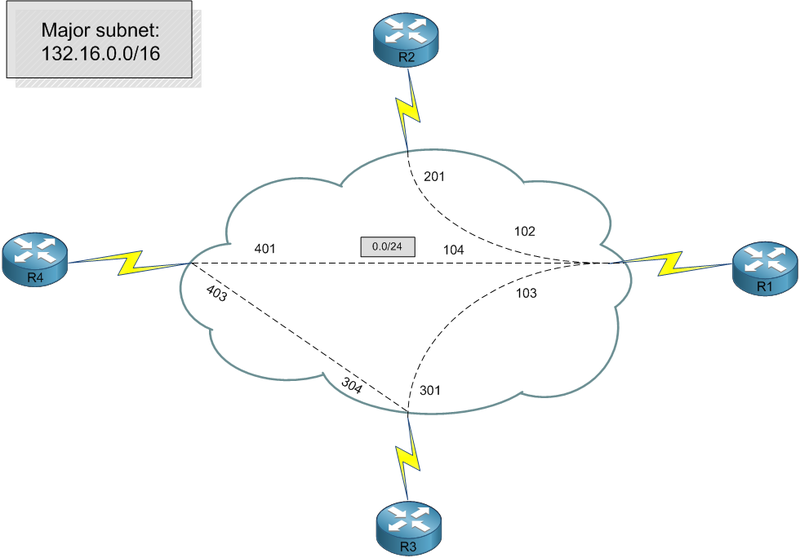 This post will describe how to do conditional advertising with BGP. In a real life scenario this can be used to only announce routes to your backup provider when your primary link is down. In a lab scenario this can be used when you are faced with a scenario that says you have to make sure that traffic comes in on interface X/X but if that interface fails it should come in on interface Y/Y. The image below describes the scenario. We start by putting addresses on interfaces and enable basic BGP. The loopbacks on the Cust router are used for announcing networks. If we look at ISP2 we have two active BGP session with four prefixes over each. Lets do a ping and traceroute to verify reachability first. 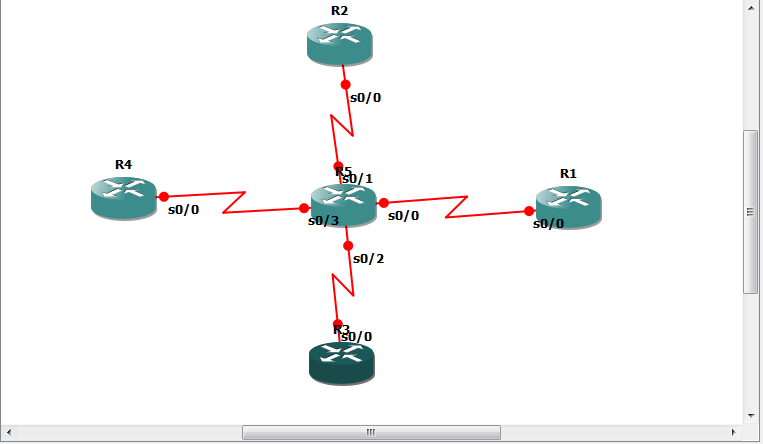 cust router into BGP. We need this prefix in BGP to be able to track it. ISP will see this prefix as a RIB-failure since it has a route with better AD (connected). We then configure the Cust router to only advertise 1.1.1.0/24 if the Ethernet link is down. The advertise-map permits prefixes to be announced when the prefixes in the NON_EXIST map are not in the BGP table. Other prefixes will not be affected by this configuration. Lets look at what Cust is announcing to ISP2. We can see that 1.1.1.0/24 is no longer being announced. Ping from ISP2 confirms reachability and a traceroute shows that traffic is passing through ISP1. We then do a shutdown of the Ethernet link on Cust and look at the results. 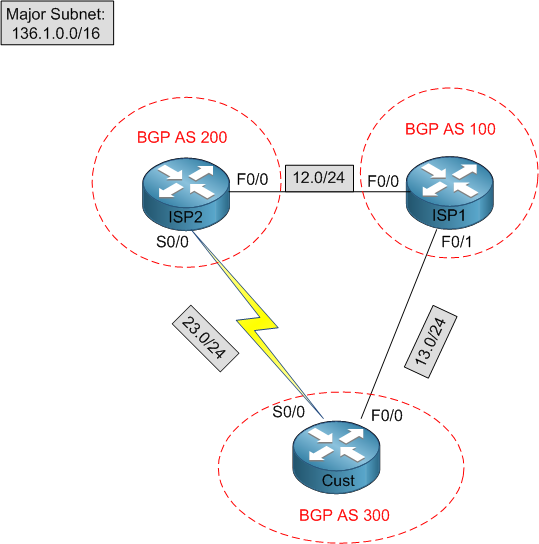 BGP table on ISP2. Ping working and traffic now going the direct path. If we debug BGP updates we will se entries like this.